Such a dainty, intriguing flower! I’ve been stalking it for a month now, waiting for it to come into bloom. Finally! Here it is in June at Pandapas Pond, near Blacksburg. This perennial evergreen herb is another forest floor inhabitant that could easily go unnoticed due to its size. In flower it is only about 6 inches tall. As you can see in the photo gallery, the white-striped leaves are toothed and arranged in whorls. The flower is pinkish or white and appears in late spring on a tall stalk arising from the top of the plant. The circular white buds seem frozen in time for a month or more, and then they open in June. Each flower hangs with face down, making it very difficult to admire unless you get down on the ground yourself or reach down and turn the flower right-side up. You can see I’ve done that a few times to get these photos. 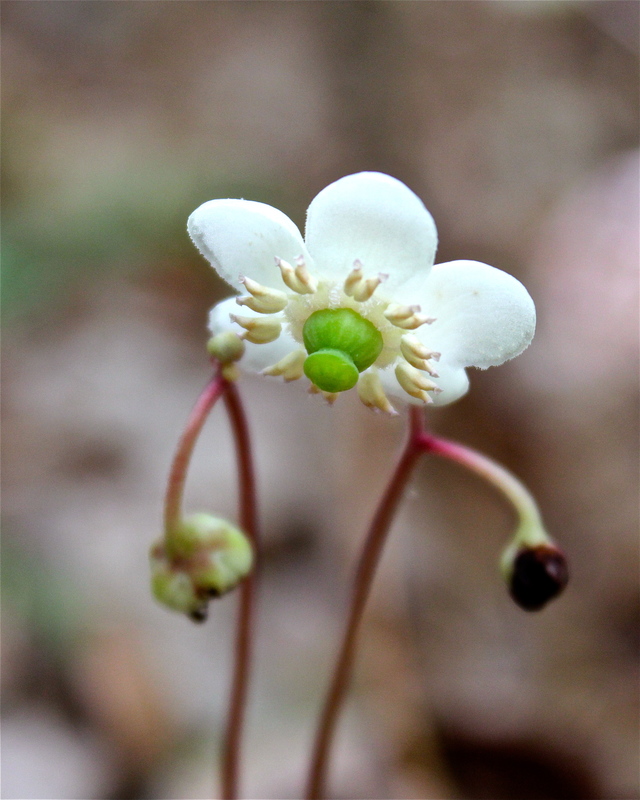 Replacing the flower later in the summer is a brown, erect capsule, which persists through the winter. Pipsisewa (wintergreen) is still used as a flavoring for foods like candy. It was also used by native Americans as a medicinal plant for treating a variety of ailments. Compare this plant to another very similar “wintergreen” flower called Prince’s Pine. The evergreen leaves of Prince’s Pine are dark, shiny and toothed; they lack the white markings of Striped Wintergreen.